Luxury motor coaches offer a convenient, comfortable way to get large groups of people from one place to another efficiently and affordably. 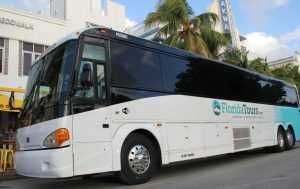 FloridaTours.com specializes in providing our clients with the modern, luxurious buses for group outings, day trips, charter excursions, and other types of travel. But we also offer our clients something else: Logistical solutions to actual business problems. Here is an example of the types of business problems that FloridaTours.com can help solve. The owners of a successful business decide that it’s time to expand. But the long-term construction project requires staging supplies and equipment in the existing employee parking area. Rather than inconvenience and frustrate the company’s employees by forcing them to walk several blocks from a remote parking lot for weeks or even months at a time, the business owners arrange for FloridaTours.com to provide fast, free, and convenient shuttle services so that the disruption to their employees is minimized. Here’s another scenario: It’s game day for a popular professional sports time. On this particular day, however, the team is playing its biggest rival so the crowd is expected to much bigger than normal. To accommodate paying guests, the team’s owners have temporarily converted employee parking area into overflow guest parking, displacing workers who are just trying to get to work. The solution? For that particular game day, FloridaTours.com’s transport the team’s game day employees from a rented remote lot directly to the door of the stadium. And at the end of the game, workers are taken back to their vehicles in modern and comfortable luxury buses — a win/win for both management and employees (and hopefully for the home team as well!). FloridaTours.com offers more than just modern, reliable transportation for group outings and day tours. We also offer solutions to businesses to real-world business problems.